It has been a busy couple of weeks here. First on the 3rd, my friend Harriet came from California and stayed with me until Sunday morning. We spent the majority of our time at Georgia's house stamping. Harriet is the one with the shopping bag in her hands and Georgia is next to her in the flowered shirt. 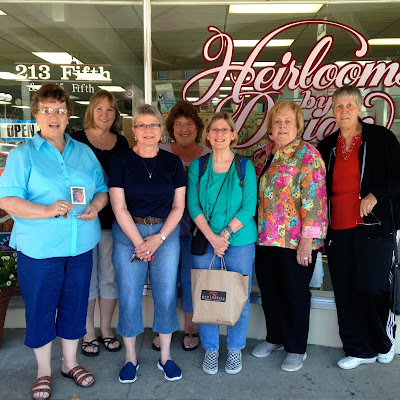 On Sunday we went and met up with the rest of our group in DesMoines Iowa for a fun filled 3 days of stamping, laughing, and shopping. It is an annual affair and we have so much fun! I got home on Tuesday evening and then on Friday I went to Kansas City MO. for lunch with a friend. Love Strouds restaurant and well worth the 6 hour drive for lunch! 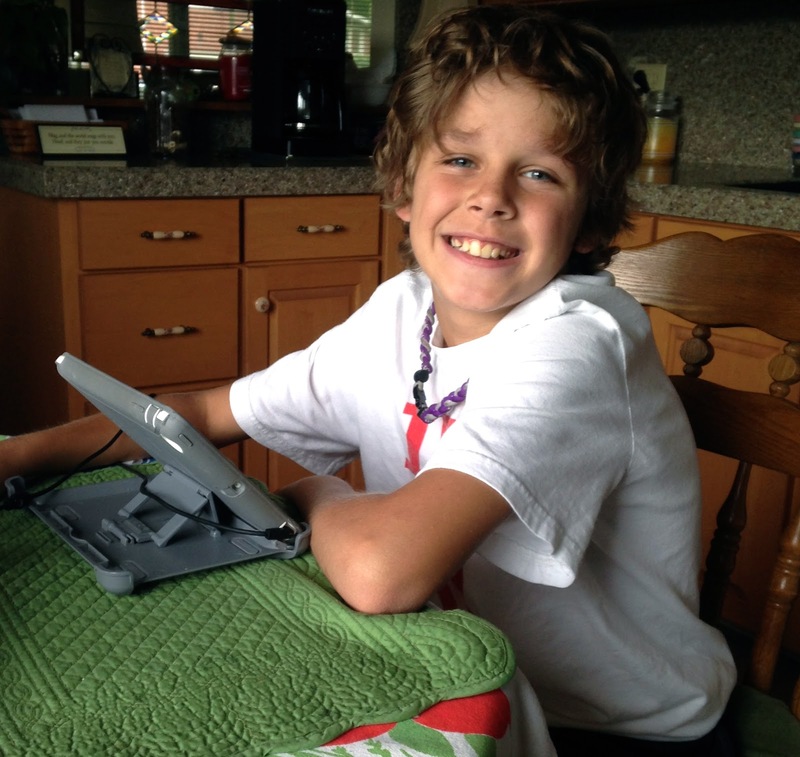 On Sunday my grandson Aaron came to stay with me for a week while he attends Camp Kindness at the Humane Society. He did this a few years ago and really enjoyed it so he wanted to do it again. We are having fun so far. We went to the store today and stocked up on groceries that he wanted. Last but not least I made this card for Georgia for our card swap this month. I was happy with the way it turned out. The flowers are from MFT. and of course a card is not complete without sequins! What a fun time I had with you and Georgia and the rest of the group! Aaron is a cutie and that is nice he gets to spend some time with you! 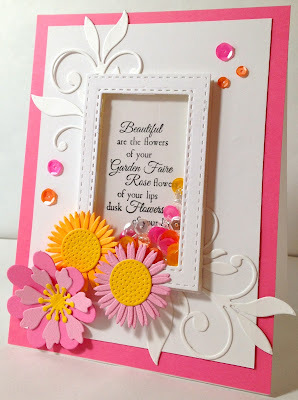 I love that card you made for Georgia - and I loved it in the other color combination too! What a busy time for you.....driving 6 hours to Kansas City for lunch???? How nice you made the trip. Aaron is sure a handsome young man! So fun to see a picture of him. He has a great smile! That shaker card is beautiful! Love the details you put into it! Yes, we had a wonderful time!! What a great picture of Aaron - how fun and so wonderful of him. Your card is fabulous!